Offering direct access to the beach, this Shoal Bay campground is within a 10-minute walk of Myall Lakes National Park and Tomaree National Park. Dutchies Beach is 2.3 mi (3.7 km) away. 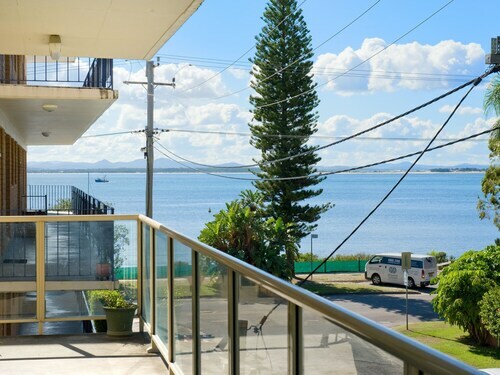 Situated in Shoal Bay, this apartment building is within a 10-minute walk of Myall Lakes National Park and Tomaree National Park. Dutchies Beach is 2.6 mi (4.2 km) away. 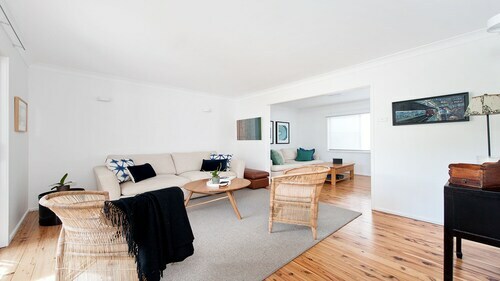 Situated in Shoal Bay, this vacation home is within a 10-minute walk of Myall Lakes National Park and Tomaree National Park. Dutchies Beach is 2.3 mi (3.6 km) away. Looking for a beach getaway that offers more? Shoal Bay is more than just a destination for lazing on the beach and snacking on fish and chips – though that’s a great way to start! Whether you’re travelling away for a romantic rendezvous with your partner, or with the whole family, we have the pick of Shoal Bay accommodation options to make your trip easy. Then all you need to do is decide whether to pack your scuba gear or your runners, or put the boat on the trailer. Whatever you decide, sun, sand, water and adventure are guaranteed. Part of the amazing water wonderland that is Port Stephens, Shoal Bay lies right near the mouth of the port. Scaling the headland that separates the bay from the open water at the far end of the bay is the first activity to conquer and an absolute must. Once at the top of Tomaree Headland, your efforts are always rewarded. Views stretch out over the islands in the distance, and along the shoreline in both directions for up to 50km. 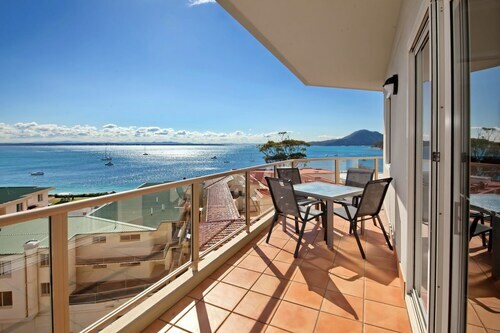 With 360-degree views back over the port, this is the best way to get your bearings for a holiday in Port Stephens. At the summit you’ll also discover historic World War II gun emplacements, and can catch sightings of migrating whales and dolphins diving through the crystal blue water. If walking is your thing, then the Tomaree National Park offers more tracks to traverse in the area. But if all that water makes you want to get your feet off dry land, there are numerous cruises and whale-watching tours departing from Nelson Bay, just five minutes down the road. From the open water, you’ll get to spot marine life that doesn’t make its way into the port. But nobody said you have to venture outside of the port to spot dolphins or enjoy the water. Even from the sandy shores of Shoal Bay you can catch sightings of the resident dolphins or visiting pods. And at two-and-a-half times the size Sydney harbour, water sports come second nature in the port. With a mixture of shops and restaurants lining the beach, refuelling and splurging on new summer fashion or necessities is just a short stroll away. Inspired by the surroundings, there are plenty of seafood restaurants and small-scale fish and chips joints serving up the freshest local catches. If lobster, prawns and fresh fish don’t tempt you, you can be different and stray towards Asian restaurants, cafes, bar and bistro options (fishy names still abound though). Getting around Shoal Bay is easiest on foot, and by car to get further afield. But another great way to soak up the atmosphere is to hire a bike and ride your way in and around the sights, smells and sounds of the bay. Why not hire a tandem for two? Depending on what time of year your visit, you might find yourself in the middle of the Blue Water Country Music Festival in June; the Festival of the Senses, formerly the Jazz Wine and Food Festival, in September; or the Port Stephens Outrigger Regatta in April. Whether it’s the peak of summer or the winter whale-watching season, Shoal Bay is a beautiful beach getaway. It’s got the action as well as relaxation. There’s every reason to find out more about our Shoal Bay hotels for your next Port Stephens holiday. How Much is a Hotel Room in Shoal Bay? 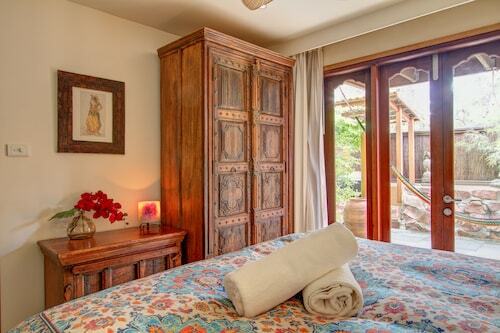 Hotels in Shoal Bay start at AU$120 per night. Prices and availability subject to change. Additional terms may apply. The room was very clean and spacious.. beautiful view and close to everything. Check in was a nightmare, everyone using the same service "Alloggio" could get their keys out of the key boxes. This took 20 mins before calling the office and being told can go into town speak to security and then get the keys after paying $20. then drive back to get the keys, this was at 10pm. But returning the keys would be the same process. The two buildings were confusing had to search for the unit at night wasn't easy going through so many keys to get in. No Airconditioning, just a fan blowing hot air around the lounge, nothing for the bedrooms, and the fan only worked on high speed - noisily.